Literary life and other musings of the author Susanna Shore. Here’s the long overdue report from my day at the WorldCon 75, my first ever time attending. The event was held on August 9-13 in my home country, Finland, so it was a once in a life-time chance to experience it with a minimum trouble. I originally thought to attend the entire five days, but life intervened in the form of work, and so I could only attend on Saturday. I tried to make the most of it by planning a full day. 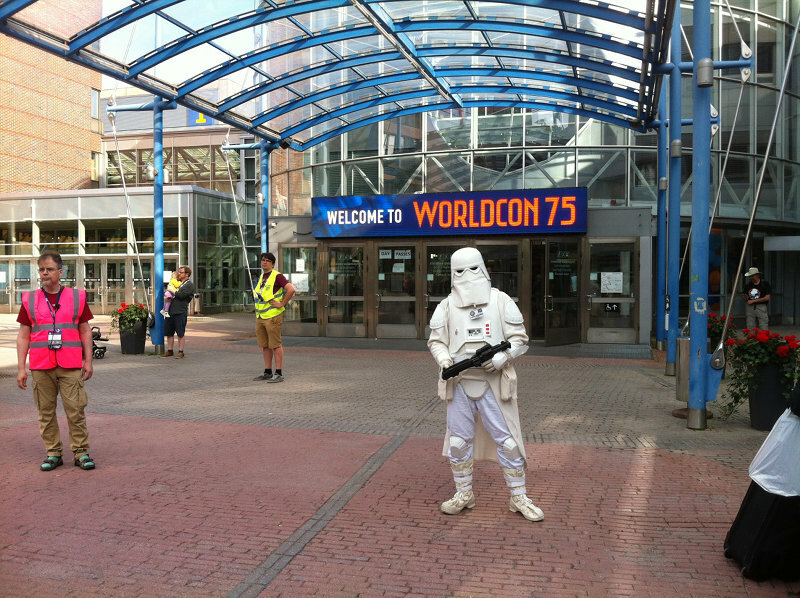 Storm Trooper welcoming me to WorldCon 75. I arrived at the conference centre about fifteen minutes after the doors opened at nine in the morning, and the queue was already at least fifty metres long. It caused me a few palpitations until I figured it was the line for people who hadn’t purchased their day passes in advance. I had, so I just walked past, trying not to look gleeful. Half an hour later I felt bad for all those people when it was announced that the day was sold out, which left most of them outside. The queue for pre-purchased passes was three persons long, the shortest line for me the entire day. I should’ve enjoyed it. The first order of business was to get a cup of coffee, but the nearest café in the lobby had a line so long I wouldn’t have made it to the first panel of the day at ten. I didn’t despair, but located the only other open restaurant, an Indian place that also sold coffee, and had my cup there with a minimum fuss. Thus fortified, I set out to find the room for the first panel. Now, I’d come prepared. I’d printed out all maps of the conference centre and marked the correct rooms, but I hadn’t taken into account my inability to decipher the maps. It took me twenty minutes to find the correct room. To my shock – even though I knew to expect it – the queue led far away from the room around a couple of corners and then some. Resigned to not getting in, I took my place in it anyway. And it was worth it, as the room turned out to be – well – roomy, and I got a good seat. Second panel of the day, Beyond the Dystopia, started right after the first ended. Luckily, the room was easier to find and it was large enough to accommodate everyone who wanted to attend. I didn’t even have to queue, though I had to settle with a less than stellar seat. The topic was interesting and even though the panellists didn’t have anything world-shattering to offer, it gave me some food for thought. And Joe Abercrombie was on it and he’s always funny, despite the gloomy topic. Then it was time for a quick lunch – only a short queue as I went for a slightly pricier option to avoid it – and deciding which panel to attend next: Authors and their Cats that would’ve had Robin Hobb on it, or Colonialism and the Space Opera. I chose the latter, mostly to avoid the long queue of the first. My tactic wasn’t entirely successful and the line was as long as at the first panel – it was in the same room – but this time I knew I’d get in and didn’t panic. I even managed to assuage the person queuing behind me that we would get in. The panel was very interesting, even though it didn’t have a chair and everyone just spoke of what they wanted. Two historians told their view and two authors from colonialized countries, Aliette de Bodard with Vietnamese background and JY Yang from Singapore offered their personal experiences of colonialism. The question of language and narrative, i.e. who controls language controls narrative, was very interesting. And since the collective recommendation of everyone attending was Ninefox Gambit by Yoon Ha Lee, I think I’ll have to read it too. 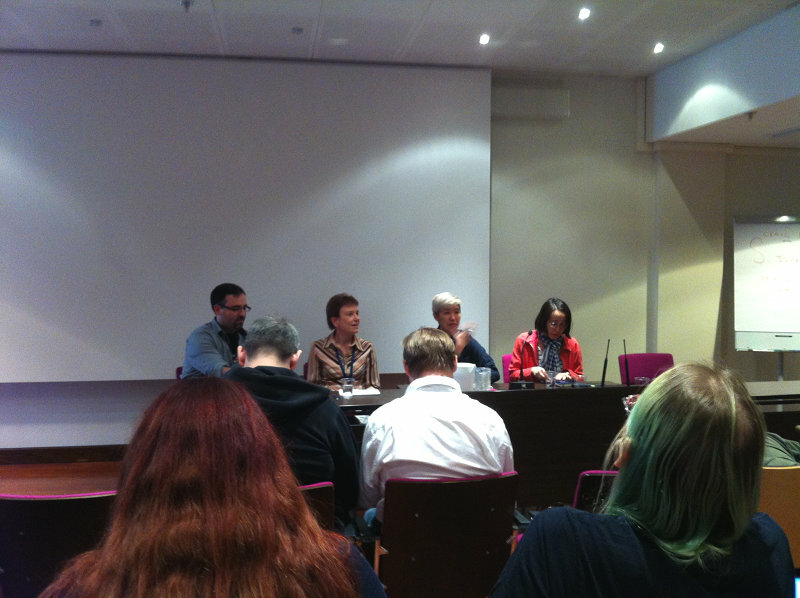 Colonialism and the Space Opera panel. My first true moment of queue came next: I wanted to see a panel that had George R.R. Martin on it and I only had about fifteen minutes to make it to the correct place on the other side of the conference centre. You can guess it: the room was almost full already when I got there and the line that snaked up and down the lobby outside it had almost as many hopefuls still. If I’d been sneaky – and I did consider the option – I would’ve attended the Authors and their Cats panel that was held in the same room and then remained on my seat, but I’d chosen differently. I gave the queue a chance anyway. I didn’t get in. But I wasn’t too sad: I’d had a close-up glimpse of the man himself on my way to the venue when he walked past me. Later I took a photo when he was signing his books. The queue to see a panel with George R.R. Martin on it. With some unscheduled free time at my hands, I went to check up the vendors’ area where the book signings took place too. Another long queue waited there for Martin to show up for his signing two hours later, and next to it, a line for those who wanted to have an autograph from Robin Hobb, which was almost as long. I’d thought to attend the latter signing, but gave it up then and there. I know queueing is part of the con fun, but it’s not for me. The line for Max Gladstone’s signing was almost empty, as he was finishing his appointed hour, but I got cold feet and didn’t go to have his autograph either. In my defence, I only have his books on Kindle and had nothing to get the autograph on. So I checked the wares instead. There weren’t as many vendors as I’d hoped for and no one sold anything I wanted to buy. The greatest disappointment was the booksellers. There weren’t many to begin with and they only sold mainstream bestsellers that everyone there probably already had, regardless of the genre. Only at the second pass later that day I managed to locate three books that I bought, though mostly because I felt I had to have something to remember the con by. I went to have a cup of coffee instead. The café closest to the vendors was almost empty, in contrast with the one in the lobby that had constant queues. And then it was already time for my last event of the day: an interview with Joe Abercrombie. The queue there was long too, but everyone fit easily in and I had a nice seat. The Finnish interviewer seemed dry and humourless at first, especially compared with Abercrombie, but he warmed up later too and the interview turned out to be truly funny. That Abercrombie is funny, always amazes me, as he is the self-appointed Lord Grimdark, which he told started as a joke that everyone took seriously. But I guess you can’t be grim all the time. The queue to see Joe Abercrombie in the same lobby as in the photo above. After the inteview, I made a quick visit to the signing area to get a glimpse of Robin Hobb signing, and managed to see George R.R. Martin too. Both handled the long queues with affable routine that was both impressive and swift. For all the queuing, each person got maybe twenty seconds with their idols, if that. I think it was good I didn’t spend my day waiting for that. People lining for a Robin Hobb signing. That was my con experience. Lots of interesting topics and even more queueing. I didn’t have a chance to socialise with other con-goers – I didn’t even pause to photograph the few cosplayers there were – mostly because I’m not good at small talk, but also because everyone was busy finding their next event and didn’t have time for chats. A few people stopped me to compliment me on my T-shirt though, so that’s something. I’m fairly sure the social side of a con happens at evening parties, but sadly I didn’t have time to stay for any of those. My train home left before the evening was over. Still, I had a great day, if long; twelve hours including the travelling time. I doubt I would’ve had energy for any evening activities anyway. I wish I’d had a chance to attend the whole con, but one day was better than nothing. 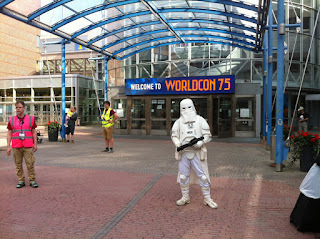 And who knows, maybe I’ll attend the next time the WorldCon is held in Europe. Did you attend? Share your experiences in the comments. 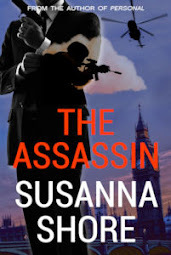 Susanna Shore is the author of Two-Natured London paranormal romance series, P.I. Tracy Hayes series of cozy mysteries, and stand-alone romances and thrillers. If you're new to my work, please download the first Two-Natured London paranormal romance The Wolf's Call for free! For news about my books, check out my webpage, or subscribe to my newsletter. You'll get a free Two-Natured London short story when you join. 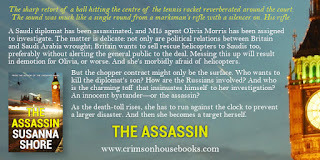 crimsonhousebooks.com. Picture Window theme. Powered by Blogger.